As a professional restorer, I've been asked many times how to repair / refinish the rubber bumpers of the MGB. After years of use, many bumpers have nicks and scratches as well as a weathered look due to sun bleaching. In this article, I'll try to explain how to properly refresh their appearance. As with any kind of repairs, proper safety equipment is a must. For this job I'll use a dust mask, ear & eye protection for grinding / sanding, a charcoal respirator for painting, and rubber gloves for the chemicals. Be sure to read and follow the directions on all the products. Some can be hazardous to your health! 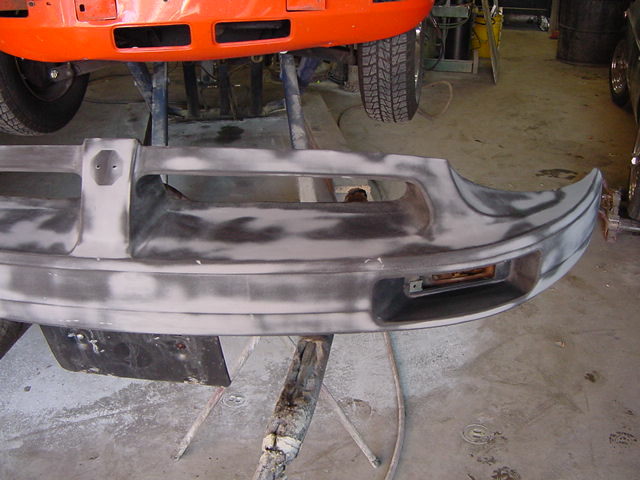 With this particular repair, I used a paint spray gun for the refinishing; however, the flexible bumper paint comes in an aerosol can if you don't happen to have spray equipment. For ease of working, you might want to remove the bumper. I started with the bumper on the car then removed it for final sanding, cleaning, and painting. Before repairs. Notice the dull, crazed finish on this MGB's rubber bumper. Start by first removing all lights, bumper stickers, and the MG emblem, then clean the bumper with a good quality wax and grease remover. I used DuPont's Prep-Sol (tm) #3919S following the directions on the can. Next, wash the bumper with a cleanser such as Fantastic or 409 and the Scotch Brite pad - scrubbing it to within an inch of its life - then rinse it with plenty of clean water. Now you are ready to make the repairs. 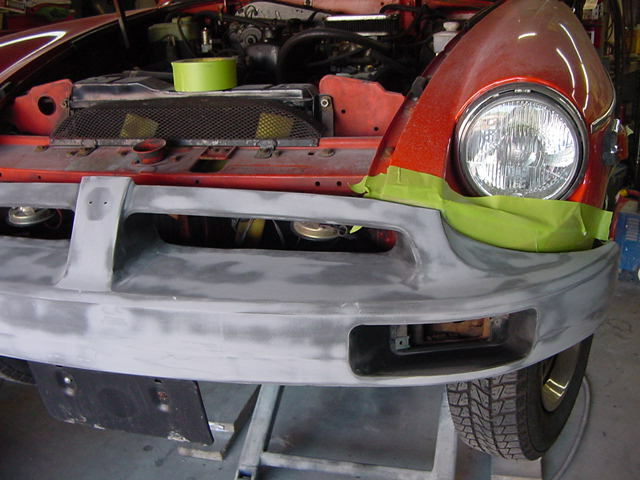 Start by sanding the bumper (every bit of it) with the 80-grit sandpaper to remove any and all of the paint from the surface. I used a DA type air sander; but it can be done by hand, it just takes longer. Clean all sanding dust from surface then wash and dry using clean, lint-free towels. Some dents and deformations can usually be removed using a paint stripping heat gun. To do this, play the heat on the inside (if possible) and outside of the area until it softens a bit. Be careful not to heat too much or you'll have more repairs to do. As the area softens, pull or push the area into place, using your fingers (careful, it's HOT) or some other sort of tool and then cool it down using cool water. If the area does not respond properly, heat and cool until it does. Bumper after cleaning with wax & grease remover and initial sanding. For scratches, nicks, gouges, and some small tears, start by sanding / grinding the effected area to roughen it up a bit and remove any loose pieces. 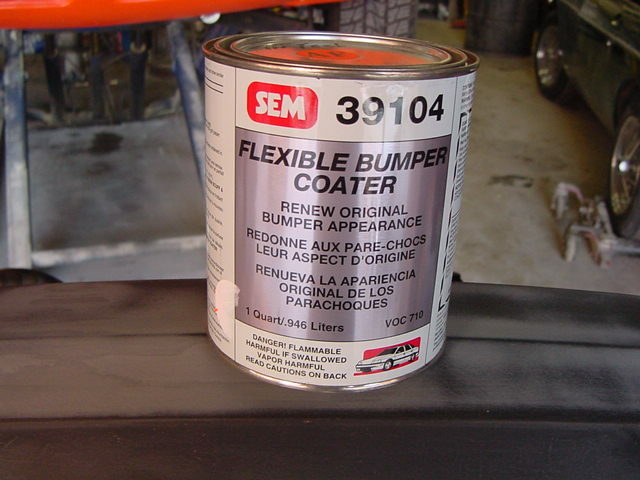 Fill the effected area by mixing a small amount of the flexible repair filler (following the directions on the package) and evenly coat the entire surface of the bumper using the auto body filler spreader. You may not be able to cover the entire surface with the amount you mixed so continue mixing more until the surface is covered. The flexible repair that I used can be worked for about 5 minutes and sets in about 15 minutes. It will set up faster in warm weather and slower in cooler weather. MGB Rubber Bumper after sanding filler. 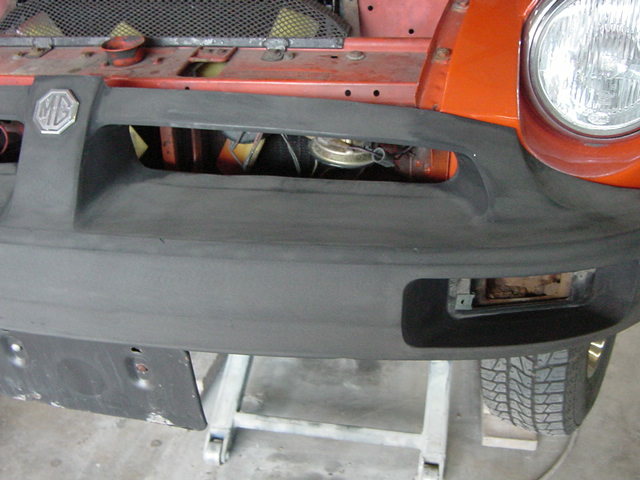 MGB Rubber Bumper after filler is applied and before sanding. 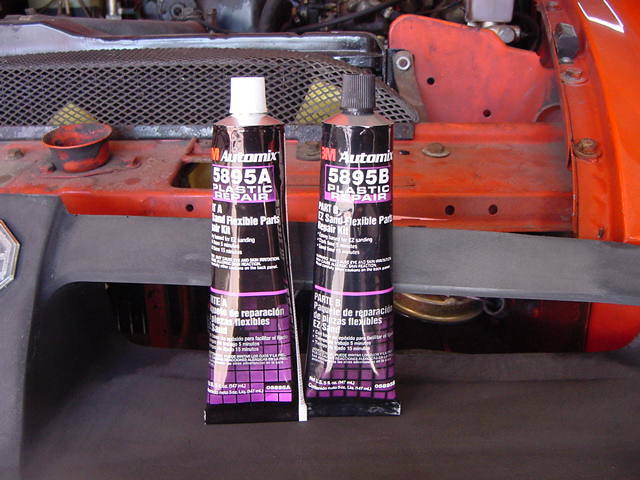 Automix flexible repair filler tubes. Automix flexible repair filler, mixing on scrap. When the filler sets up (cures), it will be smooth to the touch. Filler that has not completely cured will feel sticky and will not sand well at all. Once the filler has cured, start by sanding with 180-grit sandpaper using a sanding block or sander until smooth. If there are still small imperfections, spread another coat on the effected area and sand smooth. When the surface is smooth to your liking and all of the imperfections are removed, wet sand the entire surface with 220-grit, wet or dry sandpaper with plenty of clean water. Rinse and dry again, using the lint free towels. MGB Rubber Bumper after final sanding and ready for finish. 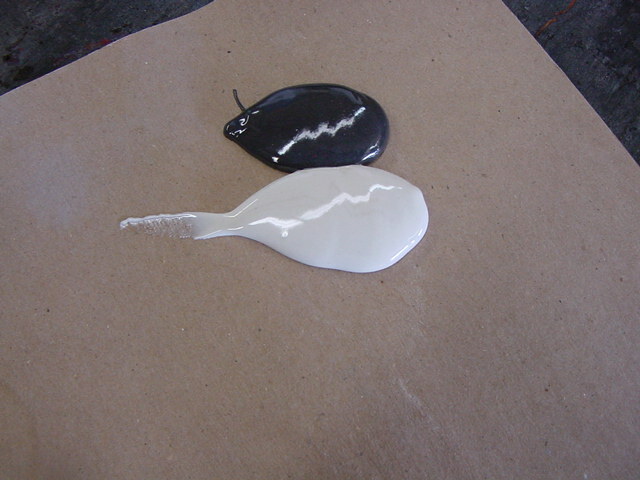 SEM 39104 Flexible Bumper Coater paint. 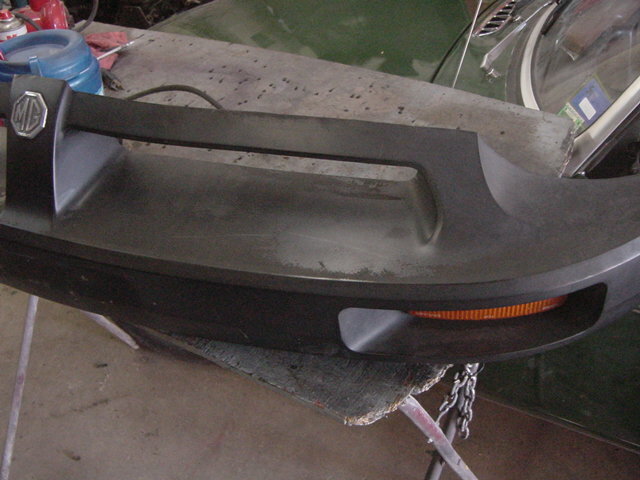 With the bumper completely sanded, cleaned and dried, you are ready to start the refinishing. Again, read and follow all instructions on the paint can and use your safety equipment! Start by applying two medium wet coats of the flexible bumper paint being sure to let it flash-off (dry to dull finish) between coats. When dry, usually in about 30 to 45 minutes depending on temperature and humidity, wet sand with 320-grit wet or dry sandpaper again and use plenty of clean water. Rinse and dry. Apply one to two more, medium wet coats of flexible paint allowing proper dry time, then wet sand with 400-grit sandpaper. Rinse and dry, lint free towels again. The surface should now be ready for the final coat of paint. 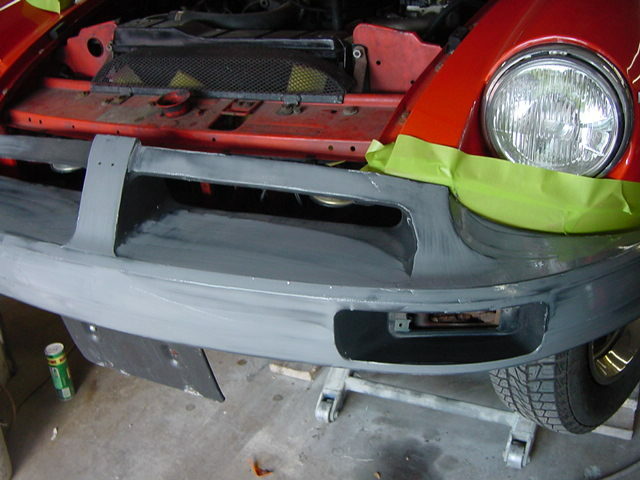 Let the final coat of paint dry overnight then reassemble and reinstall the bumper. Your finish should have a smooth, semi-gloss finish. The finished product; MGB Rubber Bumper restored and painted to like-new condition. 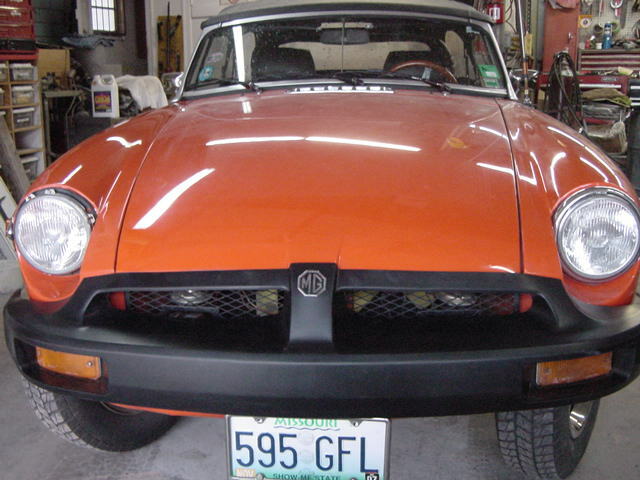 Comments on "Restoring MGB Rubber Bumpers"
When can I bring mine over John? looks great all I have to do is find the rubber bumper paint in australia or its name here and we're laughing. Followed the instructions in the article and my rubber bumpers look factory new! Very detailed. Thank you very much for taking the time for this post. Very nice informing article and i WILL USE THIS METHOD! I did mine with Black Bumper Paint aerosol from Super Cheap Auto here in Australia, after prepping it similar to as described above they came out beautiful. One word of caution regarding the black bumper paint. As you all know, the gas filler tube is just above your rear black bumper. Any spilt fuel will quickly start to eat away at your black bumper paint. Use caution when fueling and perhaps place a rag or something else to prevent the fuel coming in contact with your refurbed bumper.